We don’t really know very much about Rogue One right now. We have a title that may or may not mean something to us, the release date, and the names of one member of the cast (in an unspecified role), the director, the producers, the score composer, the source of the core concept, the person who named it, and the writer. Unless more should be revealed in the time between when I write this article and when it’s published, that’s just about it. Anything apart from that is nothing more than pure speculation. 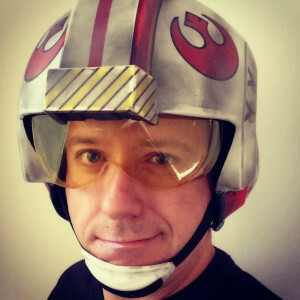 So, in order for this article to actually contain meaningful content, we’re going to have to treat a certain assumptions as if they were fact: specifically, that the name Rogue One does refer in some way to Rogue Squadron, and that it is a movie focused on the exploits of that particular unit of starfighter pilots. Now, it’s entirely possible that these assumptions will be proven false in the coming months, especially if one takes the initial report regarding the concept art for the film into account. It may turn out to be something more along the lines of Wraith Squadron, dealing with hybrid commando-pilots. It may not be a movie about starfighter pilots at all. Even if that ends up being the case, I will have no cause to complain, but I will continue to maintain the viability of a feature film centered around starfighter pilots and their spacecraft. Today, we’re going to talk about what steps might be taken to ensure that Rogue One is the best space ace movie it can possibly be. This is the face of the man who came up with the title for Rogue One. He doesn’t seem like the sort of guy who would stumble his way into a Rogue Squadron reference by accident. One of the most interesting things about doing a fighter pilot story, I think, is that a not-insignificant amount of the work in crafting the cast and plot has already been done for the writer. 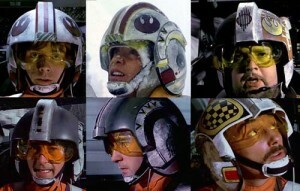 While in reality, the number of pilots in a squadron varies from one air force to the next, the traditional number in Star Wars has long been set at twelve. Twelve characters who will live, fly, fight, and die together. 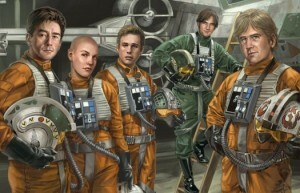 Of course, some of those pilots will naturally be cannon fodder, but one of the advantages of having your main characters belong to a military unit is that the process of killing them off and replacing them is far more organic and straightforward than it would be elsewhere, and could prove particularly useful if Rogue One is deemed sufficiently successful as to warrant a Rogue Two. Interstellar warfare functioning as it does in the galaxy far, far away, circumstances will likely also call for a mothership to ferry our intrepid protagonists from one battle to the next on those long journeys between the stars. A mammoth Millennium Falcon, if you will. But a good carrier is far more than just a vessel or means of shuttling the characters from one plot point to the next: it’s the closest thing the pilots have to a home to return to when the battle ends, a place to rest and recuperate and tally their wins and losses. Even the most dedicated dogfighting tale can’t be all combat all the time. In this, Rogue One might benefit from taking a few notes from Star Trek (the televised versions, at least), a franchise which has spent far more time exploring the subject of life aboard a starship than we have. Something else to consider: if your entire main cast is wearing the same uniform, then a bit of customization can helpfully add a dash of characterization and aid the audience in keeping your characters straight. It is this downtime that will provide the essential opportunity for all that vital and meaty character interaction that the audience loves without the spectre of imminent death looming over them as it does on the battlefield. It’s possible to achieve the same effect with a base or space station instead of a carrier, of course, but the obvious lack of mobility would be something of an impediment for far-ranging and galaxy-spanning campaigns, which is why I suspect a carrier as the most likely and narratively useful option. Speaking of campaigning, something else noteworthy is that, of the saga’s primary protagonists, only Luke ever spent any meaningful amount of time within something resembling a conventional military structure (everyone else in the saga more or less getting promoted straight to general on day one), and what little we saw of that was always under clearly extraordinary circumstances. That leaves us with an entirely new web of potential character relationships and connections to explore, and as a result, I expect that we’ll likely see a much larger cast in Rogue One and its associated works that we’re accustomed to with the saga: military operations tend to require many participants in all sorts of different roles in order to succeed, and situations are rarely resolved by a lone hero laying siege to the enemy’s fortress, sword in hand. 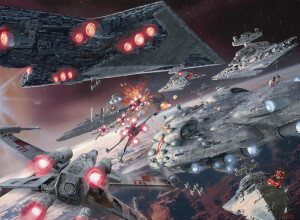 It has been suggested by some that Rogue One may feature the taking of Coruscant by the rebellion in the aftermath of Endor: if so, I can think of no better occasion to give the Galactic Civil War the epic fleet engagement it deserves. A story like this could reasonably make use of everyone from the captain of the carrier to the squadron commander to the flight leaders and their wingmen all the way down to their astromechs and the mechanics that service their starfighters. Even the cook is potentially relevant: food poisoning is serious business, you know. If we’re to borrow a few notes from X-Wing Alliance, then perhaps there’s even time for interstellar communication with far-flung family and friends. It’s generally a safe bet that any story involving Rogue Squadron will have a dogfight in space at some point. The thing about space, though, is that we’ve seen enough of it by now that it’s not all that novel or exciting anymore. Magnificent celestial visions may not be the norm in cinema, exactly, but they’re no longer revolutionary, either. If we’re going to be spending even more time beyond the atmosphere than we did in previous films, then we really ought to see if we can spice things up a bit. Asteroid fields are usually a safe bet, but we’ve been there and done that. More than once. Maybe a minefield or debris field, instead. Something along the lines of a graveyard for ships. Nebulae? Like clouds, but in space, and in more interesting colors. Always fun. Tatooine had two suns and Iego had forty-two moons: celestial bodies make for great environmental obstacles. We’ve never quite managed to replicate the success of the Original Trilogy’s designs: there’s just something extraordinarily elegant in the simplicity of flying triangles and letters. And as long as we’re on the topic of outer space, I should add that this is an excellent opportunity to make use of ejection seats to explore the stomach-churning possibilities of extravehicular activity. Might have to supply theaters with barf bags for the audience, though. We’ve already seen evidence of atmospheric flight in the first trailer for The Force Awakens, and more of that in Rogue One would most certainly be welcome. Once you start adding terrestrial environments into the equation, your options become virtually limitless. Trench run in an actual canyon? Bombing raid against a mountaintop fortress bristling with anti-aircraft guns? Battle in the clouds during a lightning storm? Capital ships dueling over the open ocean and crashing into the sea? In the right hands, Rogue One could easily lay claim to the title of being the most visually spectacular film in the saga. It’s almost impossible to have a discussion about Rogue Squadron without at least mentioning their legendary X-wing starfighters, one of the most instantly recognizable outlines in all science fiction. The prequels made an effort, but the Trade Federation’s mindless droid starfighters and Naboo’s yellow-and-chrome design scheme simply didn’t measure up as successors to the iconic designs of the Original Trilogy. If we’re going to be spending a significant amount of time watching starfighters spinning and shooting and doing barrel rolls, then there’s another tremendously difficult task ahead of us: providing the Sequel Trilogy with vehicle and vessel designs that can rival the legendary Imperial death wedges and Mon Calamari barnacle cruisers. And while I continue to maintain that it’s best to import as little as humanly possible from the old Expanded Universe, this is one area in which I think some excellent work has already been done for us. There’s something about the K-wing that I’ve always liked: I’m not sure if it’s how closely it resembles its titular letter or the fact that it has more guns than Kyle Katarn, but it works. The Expanded Universe more or less took the rebellion’s alphabet soup approach to naming their starfighters and ran with it. It gave us C-wings, E-wings, H-wings, K-wings, L-wings, and a few other more obscure options in addition to the traditional designations. I wouldn’t necessarily advocate copying the designs exactly as they are now, but they chose their letters well: it shouldn’t be terribly difficult for concept artists to come up with some suitable new spacecraft based on those outlines. As for the Empire’s side of things, I think their existing array of TIE Fighters, Interceptors, and Bombers serve them well, but if I were to make any recommendations, they would be in favor of importing the TIE Defender and the Scimitar assault bomber. I’m not terribly fond of either design, but I do feel that they come closer to matching the Empire’s established aesthetic than any of the numerous other TIE variants that have cropped up over the years. Starfighter combat may be the primary focus of the film, but I don’t think that we should overlook the possibility of using Rogue One as a platform for showcasing fleet engagements, either. Depending on the plot of the Sequel Trilogy and the timing of Rogue One, it may be our only chance at trying our hand at Imperial and rebel fleet engagements with modern film-making technology and techniques. The Expanded Universe invented a whole host of capital ships to fill out the navies of the New Republic and the Galactic Alliance, but I think that our concept artists can still do better. But for the Empire, now there’s something worth talking about: the Expanded Universe can provide us with some truly exquisite Imperial Star Destroyers, particularly those created by Ansel Hsiao. Pay no attention to the man in green. He just likes being contrary. I’m intentionally not discussing the X-Wing novels here, because hoping for anything even remotely resembling an adaptation of them would be an exercise in futility, and in any event I would prefer that film tells its own story. 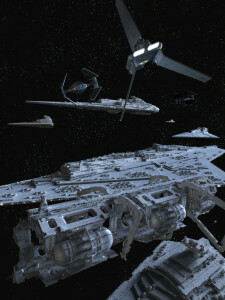 His Assertor-, Bellator-, Allegiance-, Secutor-, Altor-, and Vigil-class vessels, as well as his render of the Imperial Customs Corvette (along with anything else he might think up), are all undoubtedly worthy of a place on the big screen and would not look even a bit out of place as part of an Imperial star fleet. Though we have not yet been gifted with such a design, there would seem to be room for a dedicated Imperial starfighter carrier to rival Rogue Squadron’s mothership, as well. 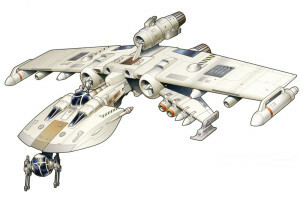 Of the Expanded Universe’s better known designs, it would be almost unthinkable not to include the beloved bulbous Imperial Interdictor, an essential element of any Imperial ambush, famous for its incredibly useful gravity well projectors, which are as capable of plucking a vessel out of hyperspace as they are preventing it from escaping in the first place. This far ahead of its release date, discussing Rogue One comes with so many strings attached that it’s almost not even worth the effort. There are simply too many different directions in which things could go for us to speak about anything with authority. As time goes on, we will likely be able to offer more specific and relevant advice: but one of the advantages of talking about this so early in the development process is that there’s still time for them act on these ideas. If the stars align and the film is what we all hope it to be, then these have been just a few of the points I think it would be good for them to consider. The market’s not exactly flooded with fighter pilot movies, these days – there are no real concerns about competition in that arena when the most recent available point of comparison worth mentioning is nearly thirty years old. I think that Rogue One is, in some ways, even more important a film to the franchise than The Force Awakens. We’ve had no shortage of talk of sequels and prequels before, but this is the first true major motion picture spinoff the brand has ever seen. We’re deep in uncharted territory, and the success or failure of this film will have huge implications on the future of Star Wars, to say nothing of how other similarly successful franchises might look to its example.